Sailors at the Wallagoot Lake Boat Club enjoyed two handicap start races on a perfect Autumn day on Saturday. It was warm and sunny, with a light to moderate breeze. Ian Curtis big Dennis 500 trailer-sailor was given the headstart, and held on to win the race. The Mosquito catamaran of Tony Hastings started last and flew through the field to claim second, just ahead of Terry Ubrihien’s Nacra. Unlucky to miss out on the podium was Luca Dorrough, making a much celebrated return as skipper on his scow Moth. He held second for most of the race and was passed just metres from the finish line. In Race Two, the wind eased throughout the race which gave the early-starters an advantage. Alan Holbrook’s Sabre won, just nine seconds ahead of Mark Gebrand’s Cool Cat, with Sian Morton’s Sabre only 12 seconds back in third place. Both Pointscore and Handicap-start series are now completed for the season, with “friendly races” scheduled for Easter Saturday, and “fun races” for the last race of the season on the 27th.The sailors wait in keen anticipation to find out who is to be crowned champion, which will be announced on Presentation Day, May 4th. All are welcome to attend the BBQ lunch on this day. 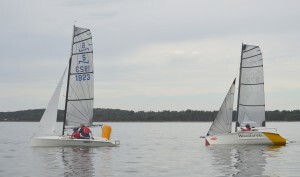 The diverse fleet finish together in handicap-start races. From left; Alan Holbrook (Sabre 1715), Mark Gebrand (Cool Cat), Sian Morton (Sabre 938) and Luca Dorrough (Moth 8958). Saturday 6th April began gloomily, with no wind and scattered showers. Slowly the clouds parted, the boats rigged up and waited as faint gusts teased the water. Officers of the Day, Jeff and Bob, patiently waited out on the lake for some wind to give a clue on where to place the buoys. 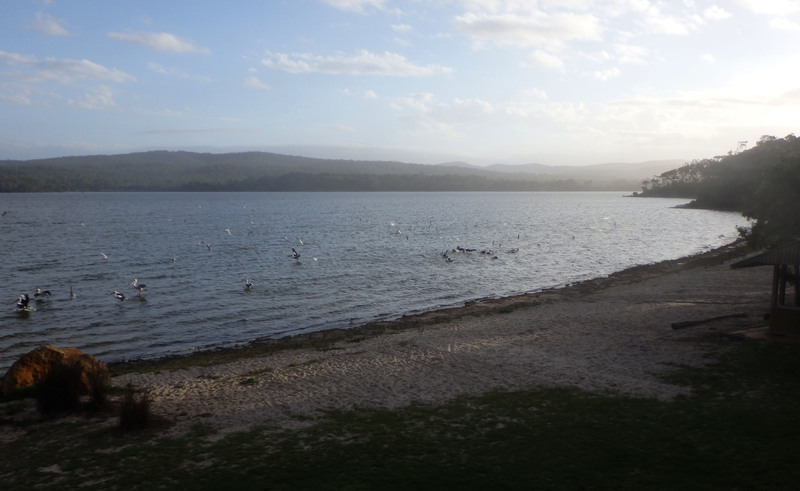 Onshore, we studied live weather readings from around the region, getting excited about 5 knots at Merimbula Airport and 20 knots at Green Cape. Some roll clouds out to sea confirmed the forecast – the southerly was close. As soon as the first puffs came across the lake, we geared up and headed out. Race One saw a close contest up front, with Josh Dorrough leading, then the Morton’s taking over, with John on the RS100 and our MG14 in hot pursuit. Alan and Neil on the Sabres weren’t far behind – within reach of a yardstick win. Meanwhile Joey and Terry fought out the Multihull division – winning a race each. The wind cranked up, an estimated 20 knots blew at the start of race 2, sending a few to the safety of shore. The Mortons lead again, while we were within a few boat-lengths all race. We both chickened out of flying the spinnaker; on “Superfly” some broken fittings, loose spreader wires and creaking and cracking noises dissuaded us from risking it. Last time we raced under kite in 20 knots the mast snapped in half. Josh and Jarrah went in at the gybe mark – Yikes! After completing the first lap, they decided to retire to shore. 1st Rob and Sian Morton, 2nd Tony Hastings & Luca Dorrough, 3rd Neil Fisher. After the races were over, the boats were packed up and the sailors retired to the club house. A school of fish went into a frenzy (Taylor? ), and soon a flock of 100 birds swooped, dived and fluttered around. While the results may have decided the club championship, and there were some thrilling moments sailing, what we remember most is the awesome spectacle of Wallagoot Lake, and how lucky we are to sail there. Racing cancelled on Saturday 31st March. Sailors on Wallagoot Lake enjoyed a couple of races on Saturday, despite gloomy conditions. The fourteen boats enjoyed various battles, as NS14 and MG14 raced closely at the front, the Sabres raced each other mid-fleet, the trailer-sailors raced at the rear, and all of them raced against the clock. The winner is not only who crosses the first; it’s who can win on yard-stick corrected time against all the others. The sailors try to trim the sails to the perfect shape, to steer the fastest route, and to out-manoeuvre their opponents. A casual observer may wonder why I call it a battle, when the guys are just sitting there, slowly drifting along. It’s more than chess, more than athletics, it’s mind, body, teamwork, engineering, and big dose of sheer, dumb luck. The wind died, the lead boats frustratingly slowed to a halt, and were passed by their rivals within sight of the finish line. Others attempted to continue racing, in avail as their boats stopped and left them parked on the glassy waters. At the end of the day, the boats sailed back to shore… OK were towed to back to shore, the results were calculated, and winners declared. In race one, Rob and Sian Morton continuing their dominance, winning again. Josh and Jarrah Dorrough finished second, and just 18 seconds behind was Neil Fisher’s Sabre. In race two, the Dorrough’s triumphed finishing a boat length ahead of the Mortons on the course, and minutes ahead of the whole fleet on corrected time. The Morton’s scored second, and Neil Fisher third. In the multihull division, while the boats traded places frequently on the water, they finished in the same order on the results sheet; first Terry Ubrihien’s Nacra, second Dennis Stanton’s Weta, and third Joey Lydiard’s Mosquito. Next week two handicap-start races are planned after a morning training session. Click here for the results of race one, here for the results of race two, and here for a photo album. It is peak season for the Wallagoot Lake boat Club; fresh winds most days, warm, clear weather, good turnout of boats each week, and our annual regatta in a couple of weeks’ time. Last Saturday was a ripper; the wind ranged from 12 to 18 knots, which is in the Goldilocks zone; not too strong, not too light, just perfect for screaming around the lake with the spray flying. We held two handicap start races, in which the slower boats get ahead start and the faster ones try and catch them before the finish. Derek Lewis did just that, in spectacular style – out on trapeze on his Contender with the boat planing around most of the course, winning the race by just 18 seconds ahead of Terry Ubrihien’s Nacra. Josh and Jarrah Dorrough scored third. Congratulations to Matt and Tasmin Alterator for completing the course in fine style on the club’s Pacer, and also to Mark Gebrand for some hull-flying stunts in his Cool Cat. As Officers of the Day, Luca Dorrough and I adjusted the course for Race two, with a shorter windward leg and faster angle for the reach. 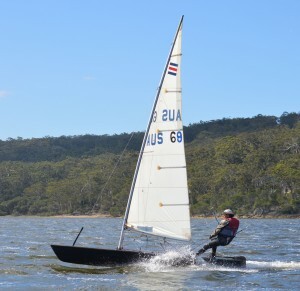 Bob Harris sailed a borrowed Sabre to win the race, 23 seconds ahead of a fast-finishing Josh and Jarrah Dorrough. Joey Lydiard brought his beautifully restored timber NS14 home for third, a fraction of a second ahead of Derek’s Contender. 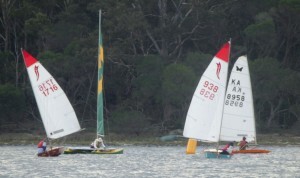 The Twofold Bay Regatta was held the previous week, which was an opportunity to sail in strong winds and waves; different to Wallagoot’s skating-rink flat waters. Luca and I had a blast, flying our MG14 under spinnaker at top speed, while surfing the waves, until a dramatic error led to the mast snapping in two. A great thing about sailing, is that even when things go badly wrong, it’s no big thing. We rolled the sails up, were towed back to shore, and friends have offered a choice of replacement masts that will get us back on the water very soon. There’s a great feeling of support and friendship between the sailors; we all help each other out rigging the boats, and putting them away afterwards. 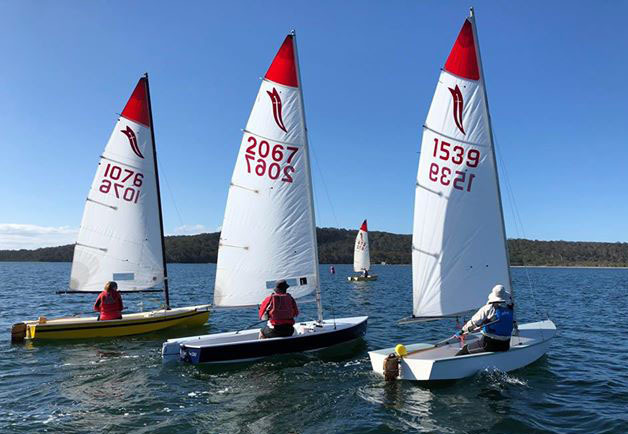 The regatta will both be great, competitive racing, and a reunion of sailing buddies coming from as far as Tumut, Gosford, Illawarra, and Canberra. February 9th began with a training session in a steady 6 knot breeze, with increased a little in the afternoon. Standout performance by Brenton, who received 3 hours training and then spent the afternoon sailing on his own, on the club Spiral. The wind shifted after the start, so it was a drag race around the course. The Wallagoot Lake Boat Club held six Sprint Races on Saturday, in winds that became strong and gusty later in the afternoon. Each race featured a single, short lap, which the lead boats completed in about eight minutes. Neil Fisher won a race and scored a second, which helps him hang onto his lead in the series. Terry Kirby equals him on points, with a two second plans and three thirds on Saturday. Darren Lydiard is now third in the series, despite having a disastrous day; his freshly restored timber NS14 developed a crack in the hull, and he found his experimental rig didn’t perform as well as he’d hoped. He then took out a club-owned Pacer dinghy, which broke a gooseneck fitting, forcing him to retire. Over the January long-weekend, Darren’s NS14 was a start at the Inverloch Classic Wooden Dinghy Regatta, where he won the feature race and many admired the beautifully restored timber. The MG14 of Tony Hastings and Luca Dorrough won three races on Saturday, blasting away from the fleet under spinnaker. Failing to contest the first day of Sprint Races in December leaves them down in 5th overall. Josh and Jarrah Dorrough’s NS14 also won a race on Saturday, plus scored two seconds and a third. Rob Morton’s RS100 won the final race and was consistently at the front of the fleet. Rob also scored a top-ten finish at recent RS100 Nationals. The Commodore’s Cup was especially organised on January 19 by Commodore Joey Lydiard, assisted by Vice-Commodore Ava Petersen. What was the event? What happened? Who won? These mysteries are being kept until presentation day. Saturday’s hot weather made for an excellent day on Wallagoot Lake, Saturday January 12, with 20 sailing boats and several water-skiers taking to the water. The Wallagoot lake Boat Club held two pointscore races, in which everyone started together, sailed the same course, and results are calculated on each boat’s yardstick. The racing was close throughout the fleet, with some fun on water battles and most of the boats finishing within 3 minutes of each other after the half-hour races. Rob and Sian Morton’s MG won race one, ahead of my MG (with Luca Dorrough as crew), followed by Gote Vikstrom’s Laser radial. It was the start that defined the race, as the pack of boats jostled for position, with a large trailer-sailor steaming through and effectively dividing the fleet. Those who took the risj of starting on port, at the port end, gained a significant advantage, while those blocked in at the starboard end tried to catch up throughout the race. Ray Redman won the multihull division, a terrific result as his goal for the day was simply to finish both races. He then finished second in race two, while Terry Ubrihien scored second then first. Darren Lydiard’s cat was missing while he acted as Officer of the Day, and the fleet was followed by a “Cool Cat’, who the club hopes will join the racing in future. The start of race two was more conventional, with several boats crossing the line as the flag went down. We decided to tack early and head towards the Lake’s estuary, which typically funnels the wind and offers some extra speed. The move paid off, and we were able to round the first mark just ahead. Luca quickly hoisted the spinnaker, so we were able to take off at full speed while the boats behind slowly rounded the buoy. The proved a decisive moment, as we were able to maintain that gap through the race and clam our first-ever victory over the Mortons, who finished second. Josh and Jarrah Dorrough’s NS14 finished third. Next week the club will host the “Commodore’s Cup”; which gives Commodore Darren and Vice-Commodore Ava discretion to run whatever events they think will be fun. 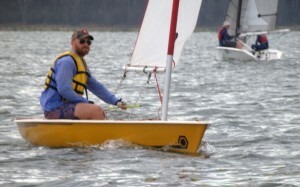 Over the summer break, I took raced a $300, 38-year old timber Mosquito catamaran in their National titles. The boat was not surprisingly slower than the $20,000 new boats, though I was pleased to keep them in sight, not come last, and bring home a trophy. What impresses me about all these sailing events, the club racing, the regattas and the titles, is how all of the sailors are friendly, easy-going, how they help each other, and make each other feel welcome. While there can be some heated and intense moments out there on the course, we all come back to the clubhouse for drinks afterwards and have a good laugh about it. Rescue Duty isn’t nearly as exciting as sailing, so photography as least gives you something to do during the race. We also made it exciting afterwards by dramatically dropping the trailer & boat back into the lake, after failing to properly hitch it to the car. No harm, no foul, right? It was a perfect day for sailing on Saturday December 1st; warm and sunny with a gentle breeze the built to around 12 knots by mid-afternoon. There was a little patchiness and shift to it, so thinkers were able to strategise and advantage. Rob and Sian Morton won both Pointscore Races at the Wallagoot Lake Boat Club on Saturday, October 27. The reigning champions have now won all four races that they contested, plus scored the equivalent of two seconds places when they acted as Officers of the Day. Their MG14 raced closely with the NS14 of Josh and Jarrah Dorrough, who scored second in both races. The main difference between an MG14 and an NS14 is that the MG has a spinnaker and trapeze. Behind them, there was a close contest between the Contender of Derek Lewis, who scored third in race one, and the Laser radial of Gote Vikstrom, who scored third in race two. Darren Lydiard was sole multihull, winning both races. He’s keen for the other cat sailors to join in the racing. While the race results tell you something of what happened on the water, it was what happened on shore that defines the club character. Before racing started, the sailors helped each other rig their boats; sharing spare parts, turning tangles of ropes into complex, functional systems and then dragging the trolleys through the sand into the water. Between and after races, the sailors sit around chatting, sharing food, drinks, and tales of what happened on the water. Next week some of the sailors travel to Canberra to contest the ACT Dinghy Championships, while handicap-start races are planned on Wallagoot Lake. Two pointscore races were cancelled due to thunderstorms over Wallagoot Lake, on Saturday October 20th. The sailors gathered in the clubhouse, checked their phones, conjectured over the possibilities and then most went for a sail anyway. The possibility of lightning caused racing to be cancelled for safety reasons. It seemed certain that another thunderstorm would pass over, and it was a question of whether this might occur during the race. It turned out that lighting struck the area around 6pm. There was also a question on whether racing in light rain is good racing. There was barely any wind in the morning, and built to around 12 knots in front of the lines of rain clouds. This provided fun sailing, with the dinghies planing and the cat getting it’s hull flying. Thanks to Ava Petersen and Bob Harris for being Officers of the Day. 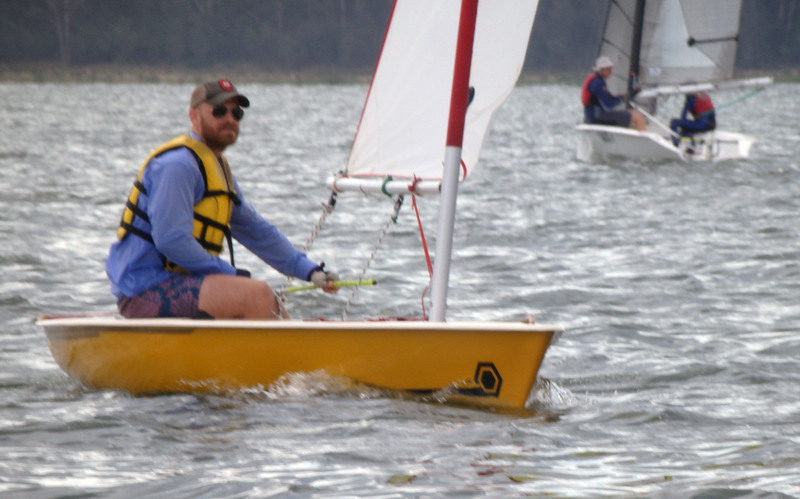 What initially appeared to be a gloomy, windless rainy Saturday turned out to be a hoot for Wallagoot Lake Boat Club sailors, on October13th. After hosting a training session and a committee meeting, ten boats set out for two handicap-start races. First away was Ava, who held on to finish second in Race 1. Sian Morton overtook her and went on to win the race, in light conditions. Rob Morton scored 3rd on his RS100. Darren’s Mosquito cat was able to take advantage of its speed to sail through the feet in wind that increased to 12knots. When asked how he won, he replied “by finishing in front of everyone else! Rob Morton scored second, and Ian Curtis was third. The lake appears to be at a low level, with a generous amount of beach to rig up on. 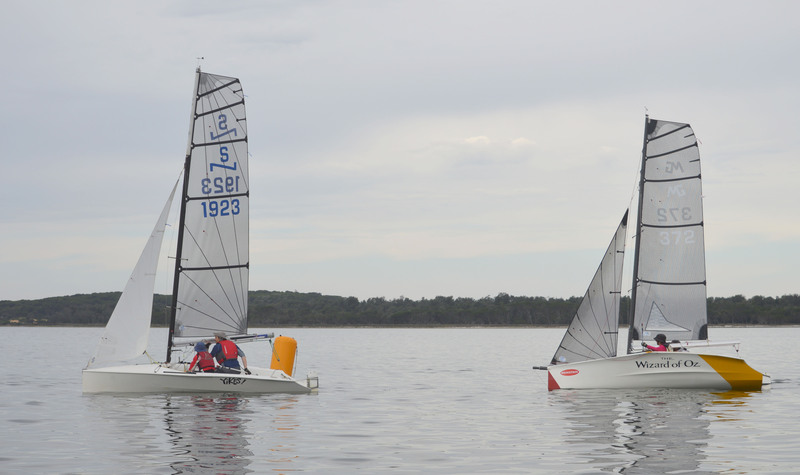 However both a Maricat and 49er tested the depth and were able to turn turtle – mat pointing straight down into lake – and neither touched bottom. The 49er managed to do this at multiple locations around the course. While there was great variety in the types of boats sailed and levels of skill displayed, what the sailors all had in common was that they had a lot of fun out sailing. Some of the boats preparing to launch for race one. From left: Darren Lydiard’s Mosquito, on lake at rear, Jeff Hope’s Tropic, Ava Petersen’s sabre, Ray Redman’s Maricat, Mike Stove’s Sabre, Terry Kirby and Neil Fisher in the club rescue boat, Ian Curtis’ Impulse, Sian Morton’s Sabre, Luca Dorrough’s Moth, under trees at right; Rod Skinner’s 49er and Rob Morton’s RS100. 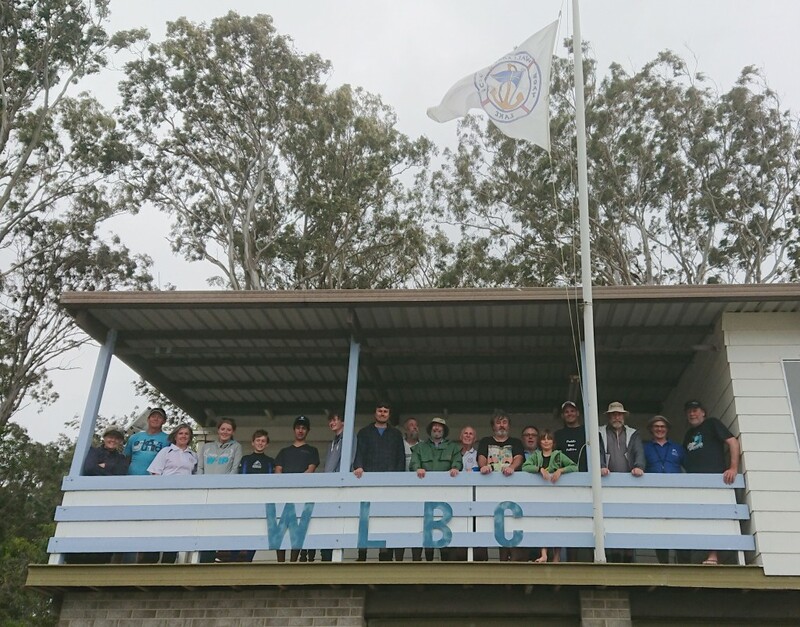 The Wallagoot Lake Boat Club’s first pointscore races of the season were held on a warm, sunny day with light five to eight knot winds, on Saturday 6th October. Seven boats entered the races; four Sabre dinghies, a Contender, an MG and a Mosquito catamaran. Thanks to Rob and Sian Morton for volunteering to act as Officers of the Day; setting the course, running the races, taking photos and being on stand-by in case a rescue was required. Thanks also to Terry Kirby for running a free sailing lesson in the morning, where he welcomed new members to the club. I sailed my MG14 “Superfly” single-handed, hanging off the side of the boat on trapeze, while controlling the spinnaker, jib, mainsail and steering. While fairly wobbly with the controls, the sheer speed of the boat was enough to win both races. On the water I raced closely with Darren Lydiard’s Mosquito catamaran, “Star”. As the only cat, he won both races. The results are calculated using a yardstick system, so a slower type of boat can win if they are close enough behind the leaders. In Race One, Terry Kirby’S Sabre “Let the Wind” was almost close enough to win on corrected time, missing out by just ten seconds. Third was Neil Fisher’s Sabre “Windsong”. More boats are expected to race next week, once school holidays have finished. This may include two more Mosquito cats, as James Oliver and I have also bought old plywood ones to race with Darren. The Wallagoot Lake Boat Club’s season began on Saturday, with seven boats enjoying a warm day with a 5 to 7 knot breeze. The club thanks the Bega Valley Rural Fire Service for helping avoid any conflict between boats and seaplanes, and for all their efforts. Darren Lydiard and Mike Stove were Officers of the Day, and ran a series of stern-chaser races. Ian Curtis has done a lot of work to his boat over winter and was rewarded by winning most of the races. He replaced the crudely shaped slab of iron that was the keel, with a finely shaped centreboard and weights in the hull. Darren called him the sand bag king – literally – he had sandbags in his boat and he sand-bagged off the start. Ava Petersen was commended for her fine sailing, which saw her racing closely with Neil Fisher. The club welcomed a newcomer, Ray, on a Maricat, who was tasked with racing Tony Hastings and Luca Dorrough’s MG14. Terry Kirby showed off his renovated Careel trailer-sailor. Wendy Miller and son enjoyed the day on a Pacer dinghy. The club anticipates running a couple of handicap-start race next week, but are still seeking a member to volunteer as OOD. They also seek the whereabouts of the pressure washer, and ask it please be returned to the club.